Grateful for an amazing day! Yesterday we had our symposium about Animal Models of Affective Disorders here at RUB. We are still amazed by the excellent speakers, the fruitful discussions and the huge interest in this topic! Thanks to Jenn, Colleen, Luisa, and Sophie for talking about their research and animal models, and for answering all our questions. Also, thanks to all the participants for joining the discussion, presenting their research and making this symposium so special! 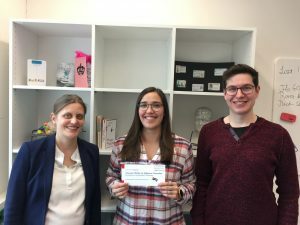 Congrats to the poster prize winners David and Bettina! We were pleased to host this great event funded by the RUB Research School PLUS. Hopefully, see you all soon! Getting excited for our symposium! 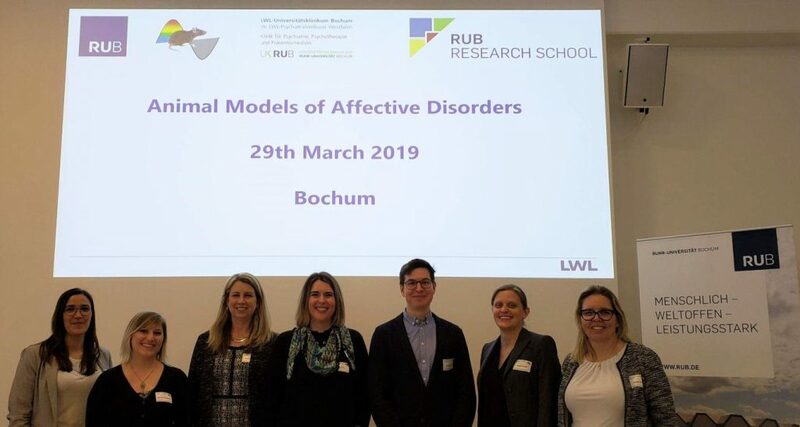 We are looking forward to two days of interesting talks and discussions about different Animal Models of Affective Disorders here in Bochum! Happy to welcome famous speakers from around the world to participate in our symposium! Dr. Jennifer Honeycutt from the Northeastern University, Prof. Colleen McClung from the University of Pittsburgh School of Medicine, USA, Dr. Luisa Pinto from the Life and Health Science Research Institute (ICVS) in Portugal, and Prof. Sophie Erhardt from the Karolinska Institutet, Schweden will talk about their models and newest research this Friday. Everyone interested is welcome to join the discussion! More info here. What the maternal side can teach us! In his medical thesis, Ibrahim is investigating the effects of maternal separation on dams and consequences of separation on the dam-pup interaction. On the German Congress of psychosomatic medicine and psychotherapy 2019 in Berlin, he will be presenting this interesting approach and first results of his analysis. 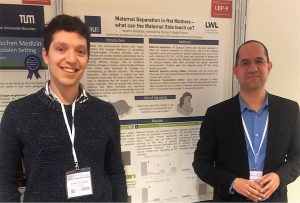 It’s definitely worth visiting his poster Maternal separation in Rat Mothers – what can the Maternal Side teach us? (LBP09) tomorrow afternoon!